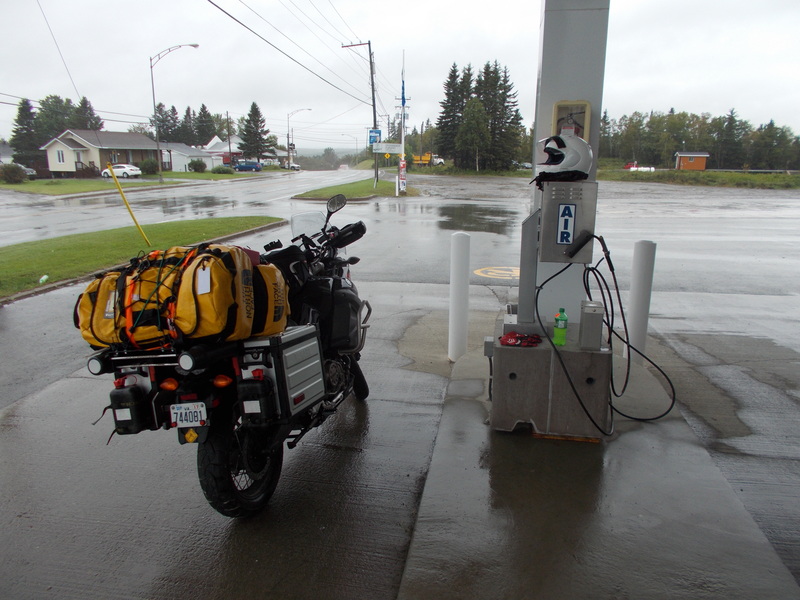 Fueling up in the rain. 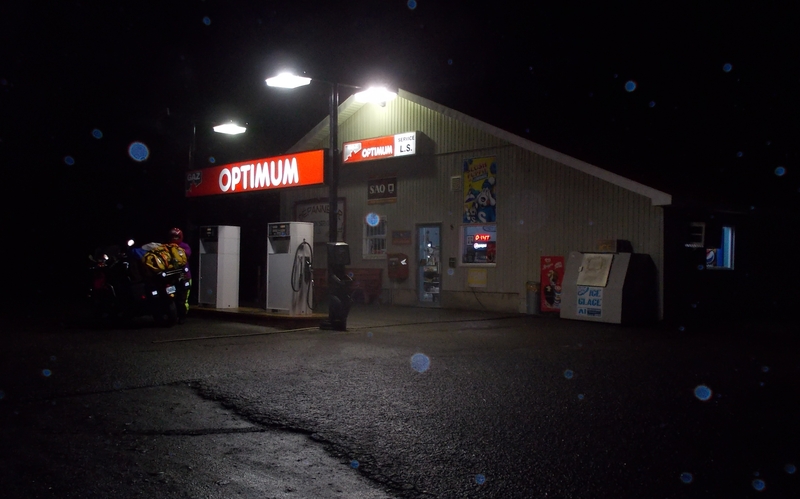 Sept. 14, Day 10: Things went south on only one of this year’s 16 day/3,000 mile motorcycle ride. It was largely self-induced and non-life-threatening, but it started simple and snowballed quickly. We’d rolled in to Perce the day before as the sun was setting – a beautiful night. Linda got us a room at the Chalet Au Pic de l’Aurore, a B&B with a nice view of the Perce Rock in the bay. We unloaded the bikes and had dinner at an overpriced but snooty restaurant called La Maison Matilde where the waitress looked down her nose as we tiredly clomped into the place in full riding gear, helmets banging off the backs of chairs in the crowded section into which we were pushed. It was like having dinner in a phone booth. We ate, got out of there, fueled up and went back to the chalet to get some sleep. The chalet’s parking lot was gravel so next morning I move the bikes to level pavement and reload the bags. The skies are threatening but I’m making pretty good time getting everything aboard. But I feel a few raindrops as I’m cinching the last bag and then it starts coming down. I pull on my jacket and helmet and gloves but I’m already wet. It puts me in a foul mood because it means I’m starting out wet and I’m only going to get wetter as the day goes on. But we mount up and ride out. Barely a quarter-mile later, I start thinking about the GoPro camera – a small video camera that fits in your palm – attached to my helmet. The chill rain is really coming down by now and I realize I have a vented case, one with slots that are letting rain get to the camera. So I have to pull over and stow the camera. 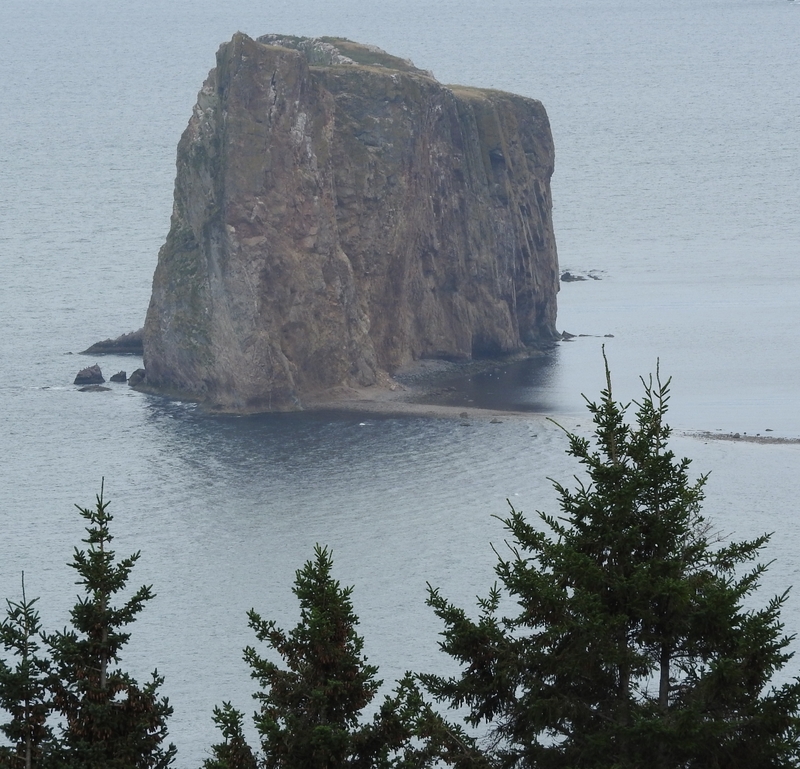 Perce Rock, the long side. The tunnel is submerged at high tide. (1) Keep each other in sight as much as possible. (2) If the line of sight is lost, the lead rider slows down and lets the second rider catch up. (3) If the second fails to appear, the lead pulls over and waits. (4) If the second still fails to appear, the lead turns back and starts looking. (5) If that doesn’t work, the lead stops before going too far, pulls out the cellphone and calls. It’s just a set of simple rules in case we get separated. Keeping one another in sight is much easier for me since I’m looking ahead. It’s difficult for her, especially if we’re spread far apart, since she has to keep me in her mirrors. So on Day 10 I stop in a parking lot, pull off the gloves, fumble the GoPro from the helmet mount, unclip the tether around my neck, and shove it in the tank bag. Linda vanishes as I’m doing this and I try to hurry because I hate being the guy who holds up everyone. I restart but don’t get far because she turns around to find me. We ride in the rain, pausing to admire the Perce Rock, a worthwhile tourist attraction in the bay. 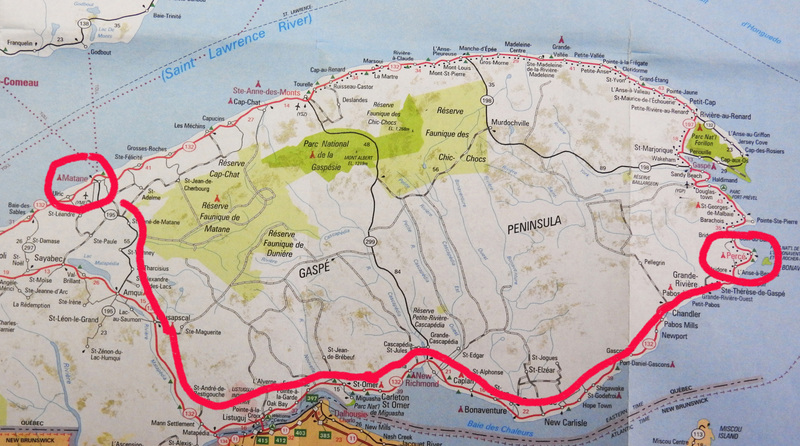 We head for Matane, about 250 miles away on 132, the Route des Navigateurs. The rain is falling hard and cold now, and we get splashed by passing cars. We’ve gone about a dozen miles when I feel something tap my right thigh, just once. It feels like the time that the Garmin GPS unit jumped out of its handlebar bracket, hit my leg, and was saved from destruction on I-95 only by the power cord attached to the dash. But I’m not running the Garmin today, and I think to myself, “now what the hell could that be…” and I start looking around. The RAM mounts for the GPS and EZPass are still attached and everything looks fine. So I start to relax a bit until I see the tank bag is unzipped. Oh shi-! The GoPro has fallen out, bounced off my leg, and is now lying somewhere on 132 in the rain. I have to find it. Even if it’s been run over, there’s a 64GB memory card that maybe I can save. I use a parking lot to turn around and zip back toward the spot where it fell. I’m looking but it’s not easy to see because the rain has turned the helmet’s faceshield opaque and I can’t raise the shield too high because the rain will start fogging my eyeglasses instead. I don’t see it as I’m racing eastward. I go until I’m sure I’ve passed the place where it fell and I turn around again, retracing my original route, knowing this is my last chance. And suddenly, miraculously, I see it, lying face up in a parking lot close to the street. It must have bounced off the road and into the lot. I hit the brakes, park, and in seconds the camera is back in my hands. And I start to get worried. Did she not see me? How is that possible? I wait about 10 minutes more before firing up Terra Nova and heading in the direction she was going. Surely she’ll be waiting by the roadside. Ah, jeez, I think. Here we go. We reconfigured our phone settings to operate in Canada during the trip. But that doesn’t help if cell service isn’t available. And it isn’t. But I do have a wifi connection. So I try e-mail. And it’s crazy, but the easiest access to e-mail is through our company system, so I use that. I’m e-mailing her at work. “It’s 1:39 pm. I’m at Irving gas station on the main road we were traveling on. No phone service. I’ll wait here until I figure out what to do.” I tap into the phone. One of my favorites in Canada. She says she’s at a Tim Hortons in Hope – 36 miles away! – and will wait there. 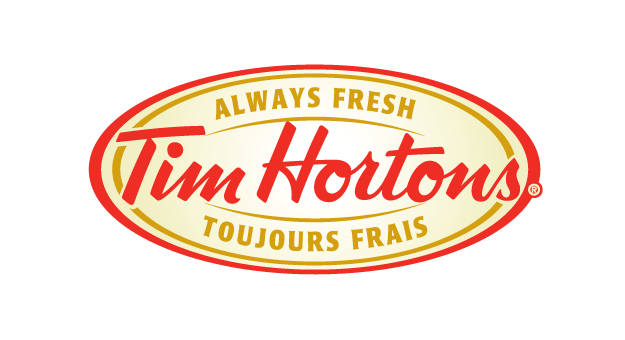 I get turned around by faulty directions from the French speakers at the gas station – they must’ve thought I wanted the closest Hortons. So that was another delay. But I make it to Hope and see her Vespa parked out front. The rain is letting up. 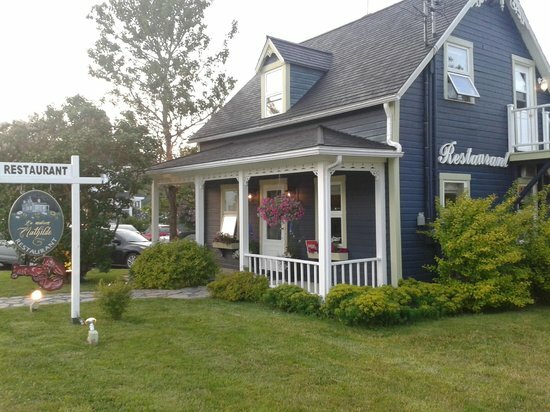 I shut down Terra Nova and squish into the Hortons, where we have a semi-emotional reunion, watched by a few curious customers over their coffee and doughnuts. It turns out she passed me and didn’t see me, assumed I was still westbound, and turned around and raced to catch up. We simply missed each other in the rain. Linda fetches me a cup of Hortons restorative hot chocolate and a sandwich and I buy socks at a nearby Dollar General and change out in the Hortons restroom. The joy of warm dry feet is indescribable. We suit up again and head for Matane, 200 long miles away. – The night clerk, a good guy by the name of John, unlocks the guest laundry room where I wash all our wet stuff and dry it. That was like heaven. 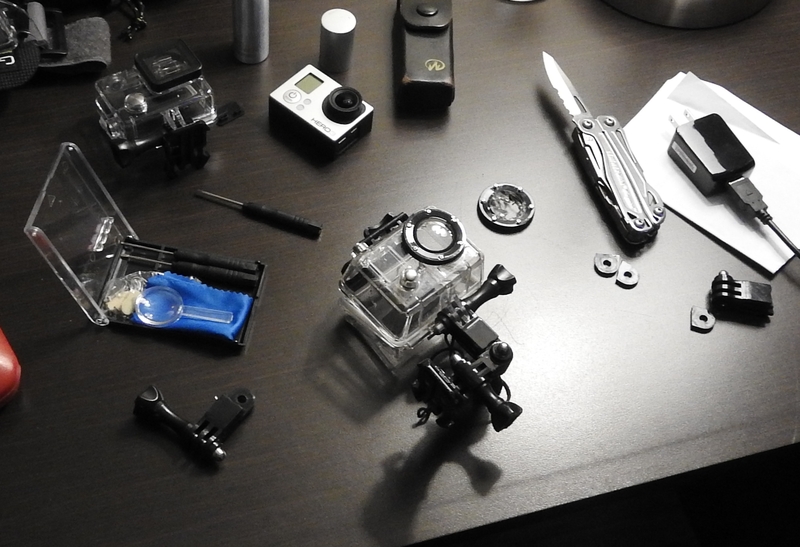 – I swap out the shattered GoPro lens shield and replace it with a spare. The GoPro still works, I find. It’s well after midnight by the time everything is sorted out and we go to sleep. And that was the worst day. This is a “love story” too because your day was made the worst when you were separated from the one you love! It will be interesting to see what the GoPro captured of your worst day! I think most of us have had those sort of days. I remember doing an early morning ride and had realised that the tsk bag was open, quickly zipped it up but didn’t look. Got back a couple of hours later and there was nothing in the bag! Wallet, house keys, and a few other bits and pieces. I couldn’t believe – after retracing my steps I found all the important stuff. And sometimes you can be lucky.